Segovia is a few kilometers away from Spanish capital. The city was founded by Romans and was declared World Heritage on 1985. If you already don’t know what to do in Madrid maybe Segovia is your option. It has a huge tourist interest. Downtown is surrounded by bell towers, walls and turrets. Settled by Celtiberians, it was conquered by Romans on 80 b.c. and turned into an important military base. As a consequence of the war of Communities against Carlos I, the city significance decreased until the 17th Century, when Carlos III founded the Academy of Artillery. Every period has marked Segovia’s personality, becoming one of the most beautiful and monumental cities in Spain. Nothing else can describe this beautiful city, you need to discover it by yourself! This is possible with our day trips from Madrid. In our Day Trips from Madrid will stop in another World Herritage city, Avila! 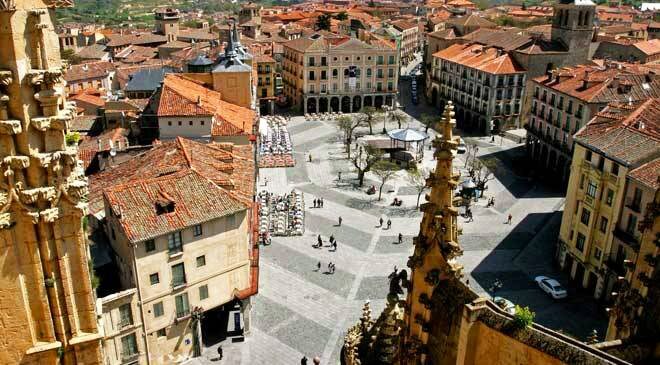 You will discover a amazing medieval town and all its ancient buildings. In here you will have a walking tour included and then some free time to continue to our next ancient city, Segovia! WHAT IS INCLUDED in our day trips from Madrid? Don’t miss anything from Ávlia & Segovia! with this option you’ll have the opportunity to get the see all the highlights of both cities, with a walking tour in every city. Convent of Santa Teresa de Jesús.